My "Fishin No Bitchin" charter with part of a limit catch of browns and kings on May 4. 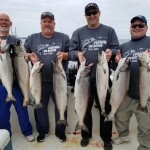 If you’re thinking about acharter trip out of Oswego Harbor for king salmon, do not delay! The spring king salmon fishing right now in shallow water is the best I’ve seen since 2012. 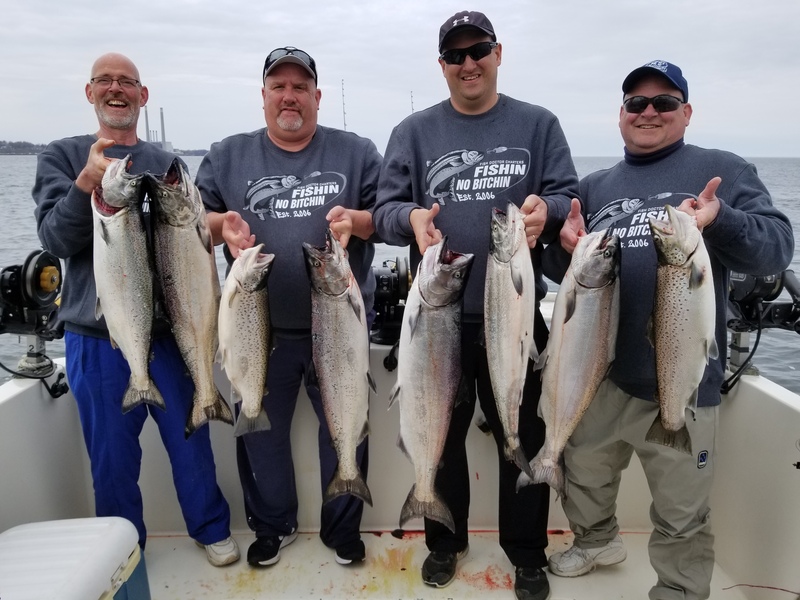 Wow, those kings are fun on light tackle down to 6′ custom built Fish Doctor Shortsticks and Altum 12 reels spooled with 10 lb. test Berkley/trilene line. It takes a silk smooth drag and plenty of 10# line capacity to tame a high octane spring king in 40 to 50 degree water, and the Altum 12s have proven them selves. It also takes a light hand on the rod and my ”Fishin No Bitchin” fishing team had just that on May 3 and 4. I’m not a big fan of “meat” shots, but this crew deserved to show off their stuff!